Immunity is “Capacity of the body to protect from diseases or infections.” If you are protected from a disease, you are immune to it. Immune system is considered to be the soldier of your body, as it protects you from all kinds of illness. 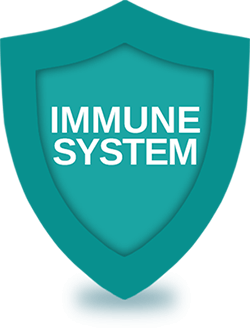 The immune system is made up of special cells, proteins, tissues and organs, and defends people from germs and harmful micro-organisms every day. The atmosphere you live in is populated with trillions of germs. Every single breath that you inhale, every drop of water you drink or every bite of the food you eat, all contains germs. People are vulnerable to attack by germs. So, what makes a person catch a disease while others remain healthy in that situation? It is nothing but the strength of one’s immune system. Strong immune system fights against those germs and keeps you protected. People with weak immune system, may catch these diseases more easily. So, your immune system plays a crucial role in maintaining proper health.